For high rollers only. 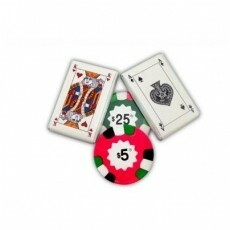 Our chocolate casino kit is perfect for casinos or a casino themed party. 1.44oz clear cello bag filled with 2 dark mint chocolate playing cards and 2 milk chocolate poker chips. Tied with ribbon color of your choice.